Sometimes I wonder whether time is even linear at all. It doesn’t seem like we experience it that way. There’s now and there’s before and there’s an expected tomorrow, but where in all that is reality? What is real time? I think reality is how one experiences it. The personal original thought. I think a lot about the personal original thought. I mean in a way you could say that everything’s been done, right? In art, writing, music and especially in fashion, but if you can clear your mind enough of other people’s messages and ideas than your own original thoughts are allowed to come through, aren’t they? In my mind, this is transcendence. To be or not to be! I’m actually coming to a point, believe it or not. Or a couple / few points. Reality is a personal experience. Time perception is a personal experience. 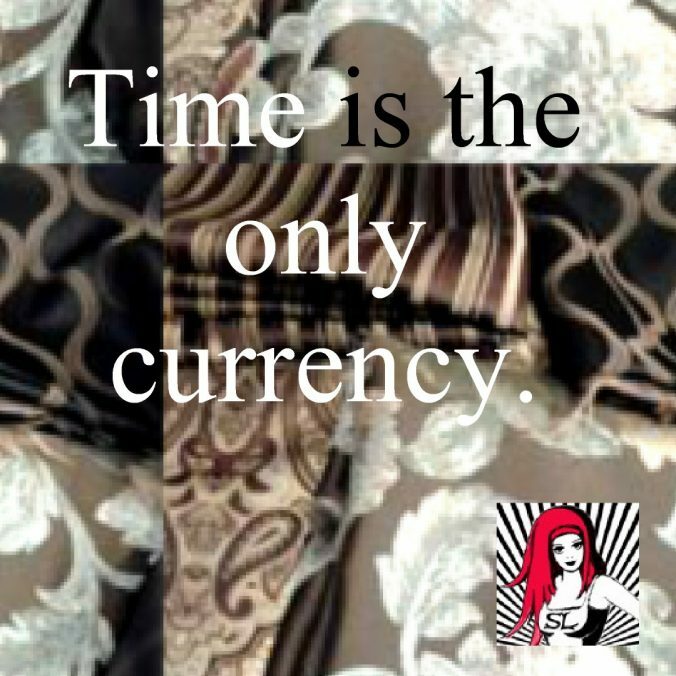 Time is our only currency in life. I started writing and I thought was only telling my mom’s story and her struggle with mental health, to explain my opinions about it and the reasons why I have them. Now I realize that in order to tell her story, I have to tell mine ( hahaha….like in Ghost Whisperer – I love that show). Now we come back to that whole divergence re time and reality. I don’t remember my childhood in a linear fashion. It’s like it happened all at once, the younger memories being foggier and as an older child, my memories become clearer. And certain points in time stand out more than others. I don’t know why this is. I used to think I only remembered the bad things, but now I realize this isn’t true. I now realize that all my memories are like this, not just my childhood ones and this is what makes up a life, doesn’t it? A kinda muddy fog of memories with some bright points of light thrown in for good measure, isn’t it so? My mother gave me this life and for that I’m grateful and at this point, I’m crying. I guess because it has taken me a long time to say that. It’s also how I talk. Some people might call it crazy. Others would say it’s creative. I just think it’s my reality and maybe others experience time and reality this way. I don’t know. I think, therefore, I am. And for a crazy person I’m pretty highly functioning and after all, that’s what matters, right? This conversation (monologue?) has now come full circle and it ties up a few different points, doesn’t it? First of all, I might have inherited my mom’s crazy after all, but because I’m so high functioning, no one much notices, including me. Secondly, I did not experience my childhood in a linear fashion. Time was allowed to warp. I think we can get back to the story now. As I recall, we left off with me having to be rescued from babysitting job after having ingested Neo Citron in lieu of a candy and fallen in a comatose sleep. You think after such goings on I wouldn’t be invited back to babysit, right? Well, I don’t remember babysitting at Raquel’s house again, I do remember a trip we took to Nelson, BC together. I believe this is a little later on in my 11th year as we moved from Lancaster Crescent when I was 12 (my parents lost their house, but we’ll get back to that later). Anyhow I don’t remember my mom being around much then, but I do remember her being pretty fed up and unable to cope with me at the time. I have to say I took this pretty personally then, but later I realized she just wasn’t very good with older children. Of course this excuses nothing. If you have children, the best thing is to commit to raising them and if that can’t be the case, perhaps make other arrangements? It was decided, that since I was quite literally driving my mother crazy, that it would be best if I went on a trip with Ryan, Raquel and Raquel’s three kids Blane, Tanya and Mitchell. Nelson BC where Raquel’s mom lived all six of us in Ryan’s pick up. Now I don’t remember if there were 2 seats (front and back) in the cab of the truck, but I don’t think so. All I know is that Ryan, Raquel and the kids were in the front and I was required to lay down in the bed with all the stuff and then the closed me into the back and I traveled this way to Nelson and back.